Used to create watertight compression seals. ANSI 304 grade Stainless Steel (= 18-8 or 18-10 stainless steel). For improved corrosion resistance. Fits: Tightly fits and seals #4 or 2.9mm screws. Metal Backing: 24 Gauge 304 stainless steel (aka 18-8 or 18-10 stainless steel) improves corrosion resistance. 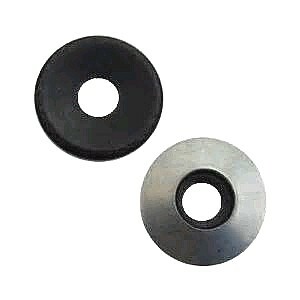 Seal Rubber: EPDM, Neoprene, Silicone, Conductive EPDM, other.